Creamy, hazed golden peach color. Strawberry and chocolate aromas. Hint of spiciness. One-finger off white head that dissipates quickly. Leaves scant cover. Spots of lacing on the glass. Chocolate dipped strawberry on the lips and front of tongue. Finish has spice warmth. Medium bodied. Interesting sweet and spice playfulness. This beer is based on chemical analysis of pottery fragments found in Honduras which revealed the earliest known alcoholic chocolate drink used by early civilizations to toast special occasions. The discovery of this beverage pushed back the earliest use of cocoa for human consumption more than 500 years to 1200 BC. As per the analysis, Dogfish Heads Theobroma (translated into 'food of the gods') is brewed with Aztec cocoa powder and cocoa nibs (from our friends at Askinosie Chocolate), honey, chilies, and annatto (fragrant tree seeds). It's light in color - not what you expect with your typical chocolate beer. 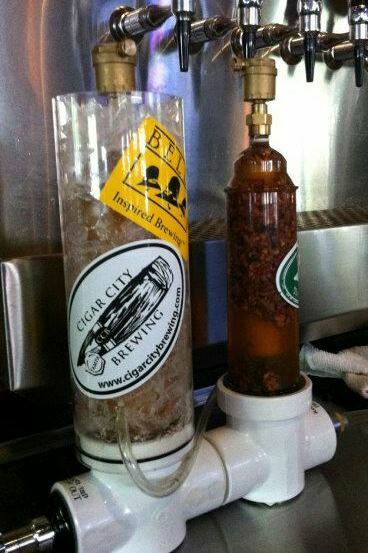 Not that you'd be surpised that we'd do something unexpected with this beer! At a recent World of Beer-Carrollwood, Dogfish Head tap-takeover, eighteen different DFH brews were featured. This one was run through a Randall of Aztec Fire Tea. It's flavors are those of chilles, strawberry and chocolate, which are in line with the ale's original taste, but the tea further enhanced the profile. The Randall imparted an up front taste of chocolate dipped strawberries and finished with a mild twang of heat. The strawberry flavor was a nice stand-in though it overpowered any of the annatto flavor. Now I must do a straight-up review on Theobroma to compare.